February 24, 2016 November 8, 2016 - by Ms. Mike Portes - 6 Comments. Thirty years after Ferdinand Marcos, Sr. was ousted from his seat of power, the miasma of anxiety has grown thick over the possibility of his JUNIOR occupying the second highest post in the Executive branch of government. For the past two years, the #NeverAgain hashtag appears in social and mainstream media, grabbing at each opportunity to make it a trending topic. Edsa People Power hits its THIRD DECADE and news feeds are choking with nostalgia over all that culminated in the Ramos-Enrile led Fiesta revolution. #Edsa30, Wow! and yet another Marcos offering a new strain of flu shot to a cancer resurfaces in the NATIONAL political arena. THREE DECADES since the bloodless revolution. THIRTY YEARS! What an opportunity to blot out a name equated to dictatorship, plunder, greed and abuse. The Filipino people had THREE DECADES to render an influence, powerless. THIRTY YEARS. THREE DECADES. What happened? Indeed, “Those who forget the lessons of history are condemned to repeat them.” and guilty is the people who has little appreciation of our rich past, the plight of our country should then come as no surprise. For the price of mineral rich ancestral lands, Marcos is imbrued with the crimson blood of Macli-ing Dulag and other indigenous peoples and for the same reason, is the incumbent Aquino tainted with that of the blood of the Lumad, some as young as 13 years old. Just recently, a church sponsored Davao evacuation camp for Lumad refugees was torched by unknown riders. 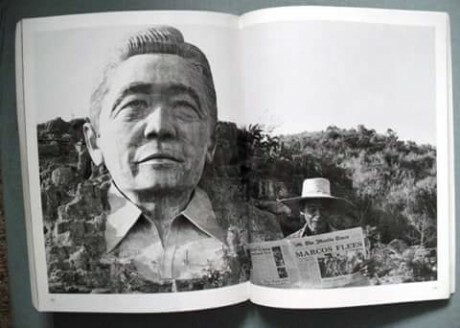 The Marcos administration looked away at the injustice done against the doctor of the masses, Dr. Juan Escandor, whose skull was seen stuffed with briefs and plastic bags upon exhumation. In 2011, another doctor was killed for his conviction. Dr. Gerry Ortega’s voice against the mining in Palawan was silenced. He was assassinated in broad daylight and four years later, the suspected masterminds, who are detained after eluding the local immigration for 4 years, dared to declare candidacy for the coming elections! Has there been any remarkable difference in the system, pre and post the bloodless revolution? Marcos has the Escalante Massacre. Cory had the Mendiola and Luisita massacre. Arroyo has the Maguindanao Massacre. PNoy has the Mamasapano Massacre. Drenched in blood is our recent history and we are not even at war! The Coco Levy Fund Scam of Marcos, Danding and Enrile. The Bataan Nuclear Power Plant Debt: A project that was protracted from the Marcos, Aquino, Ramos, to Arroyo. The Cory admin’s Operation Big Bird. The Textbook Scam (Estrada Administration). And of course! The PDAF/DAP scam of “Ma’am” Janet Napoles with Enrile and the senator son of Estrada, among others. The prostitution of the country does not end with the lies of our politicians and the guile of oligarchs, cronies and monopolies. It starts and replicates tenfold in each Filipino who exclaim empty pride yet fail to understand the responsibility of one’s nationality. What has become of Filipinos that we are so self-entitled, that we dare act like lords and masters oblivious that our privileges are imbued by the blood from forgotten wars. What has our beloved country become when wars and revolutions are not waged with ammunition but with supine and manipulation. We had been made into drones by a slanted media and brittle faith. There are soldiers at the forefront, made to believe that they are protecting the sovereignty but in reality, are expendable pawns for the economic gain of a few. Our future generations are sold for a dime dozen all over the world. We wear blinders to child labor, Forced labor, workers who are underpaid and overworked. Our environment wasted by the indolent. what has been done lately to claim that pride? We celebrate the “freedom” born of the Edsa People Power but the oldest of issues – poverty, corruption, impunity, patronage politics – are left unaddressed even THIRTY YEARS AFTER Imperial Manila’s People Power. And now, a Marcos no longer whispers but bellows. ?THREE DECADES since the bloodless revolution. THIRTY YEARS! What an opportunity to blot out a name equated to dictatorship, plunder, greed and abuse. The Filipino people had THREE DECADES to render an influence, powerless. THIRTY YEARS. THREE DECADES. 30 Years is all it took for China, South Korea, Taiwan, Thailand, Malaysia, Singapore, and Indonesia to overtake the Philippines. The war ravaged Vietnam will overtake us in 5 years. And now, it will take 50 years for the Philippines to even reach the status at which these countries are now, assuming the Philippines corrects it’s course today and assuming it can. 30 years of trying to hide that Marcos was not unique in Asia. Dictatorship was the zeitgist of the time, and Marcos looked like a kindergarten in terms of brutality and plunder compared to the dictators of China, Cambodia, Laos, Vietnam, South Korea, and Indonesia. 30 years of writing half truths in history. 30 years of glorifying EDSA1, which indeed the world admired. 30 years, other countries did not need the admiration of the world; they just gradually and QUIETLY made the transition from military rule to democracy. Now, other countries have proven EDSA1 was a stupid move, and they cannot stop laughing. And they won’t stop laughing even this 2016, as we will vote again the lesser evil. 30 years of propaganda and half truths. Now, the people are free, but stupid. The most dangerous lies are those that are nearest to the truths. 30 years, they had all the chance to make the Marcoses accountable, and 30 years they have failed. And now, they want the Junior Marcos to apologize in lieu of their failure. What a convenient way to cover their miserable failures. Indeed, the most dangerous lies are those that are nearest to the truths. 30 years ago, there was just one plunderer. Today, there are plunderers left and right that if you total what has been plundered for 30 years, that one plunderer 30 years ago now looks like an amateur. The national budget during the military rule looks like peanuts now compared to the three Trillion budget of today. And yet, they trumpet that Yellows are of Daan Matuwid. Indeed, a lie that is repeated often enough becomes a truth. 30 years ago, there were projects left and right. Today, there are projects left and right, but they remain in the drawing boards, instead of being implemented as before. And yet, they call that development. Indeed a lie that is repeated often enough becomes a truth. 30 years ago there was heavy foreign borrowing to support projects. Today, we are back to heavy foreign borrowing to support non-existing projects, but just to flood the system with cash. Thus, we have a glut in real estate, a car industry driven by low interest credits, a consumer market driven by easy to get credit cards, five fold smuggling, and gambling, illegal or not. Of course, what is obtaining is a BUBBLE economy, and they call that the fastest growing economy. I call it a donut economy as it is empty in the middle. If a hostile administration takes over in 2016, of course, they will burst that bubble economy so that the next administration will have a hard time bursting the lies and bubble of 30 years. That is the truth and not a lie. 30 years ago, there was controlled media. Today, the media men, who lost their jobs, are back with vengeance. There is free speech. They just make sure the Yellows have the loudest speech. Who needs free speech when your speech is drowned out anyway. 30 years ago, there was curfew. Today, you can move at night, except there are criminals waiting for you. What the hell, I might as well stay at home. 30 years ago, there were strikes left and right, but Marcos would not even dare busting the labor unions. Today, there is industrial peace, but there is also ENDO; the busting of unions have been made complete. 30 years ago, there was poverty. Today, there is poverty, but there is CCT. The yellows want the poor to remain poor by teaching them mendicancy. It is the institution of pauperism, so that oligarchs can be institutionalized. 30 years ago, there was no technology. Today, there is technology, and the Yellows say we should be proud of this. So, we pay the highest energy cost, the most expensive pokey internet, the highest taxes, the lowest SSS benefits, etc. Why? The Yellows have the illusions technology came from them. They live their own lies. 30 years ago, there was one man rule. Today, the yellow rules, and no one man rules, but that is only so, so that people will not know who can be held responsible for all the lies that have been perpetuated all these 30 years. You cross-haired on all valid points, Add! If only our people cracked the whip and consistently demanded for efficiency in discarding impunity and patronage politics, change could have been implemented. Problem is, many Filipinos were too high with the post-People Power Hepatitis. Morally ascended witch-hunters most have become without any idea that they have helped raised the devil from hell, thanks to ubiquitous ignorance! And while the rest of the country was in a Yellow stupor, the Marcoses were busy re- establishing themselves at their turf with windmills. And now, they blame those harping on the memory left by BBM’s father? Hahaha! Why? Was all of 30 years not enough for their Messiahs to blot out one name? Well, that’s what people get for playing the fool. It’s just too unfair for those of us who always had been critical to share the fate. Thank you, Add. There are tons of things to hate in this country, but like a kid abused by his mother, I cannot help but still want the best for her. Your comment did not only highlight what 30 years of EDSA made of our nation but also serves as a roadmap of what ills our country sorely needs to address. Marcos is history…same as the Japanese Imperialists Collaboration of Benigno Aquino, Sr. is history. Marcos is past. He is no longer relevant in the political arena. We are looking at the present: Benigno Aquino III administration. Aquino and Mar Roxas try of deflect the issues of their being : thieves, liars and incompetent. By resurrecting the ghost of Marcos and his martial law. This is just a stupid way to deflect the true issues against; what you have done to the country. Let us all move on from the past. EDSA is an “evil spirit” of Cory Aquino and her Feudal Oligarchs, to haunt people. So that, they can stay in power, and keep their Hacienda Luisita. These scammers are vicious.